(Bloomberg Opinion) -- UnitedHealthGroup Inc. is doing great. America’s largest health insurer released first-quarter results Tuesday that beat analysts’ expectations, and it raised full-year earnings guidance. 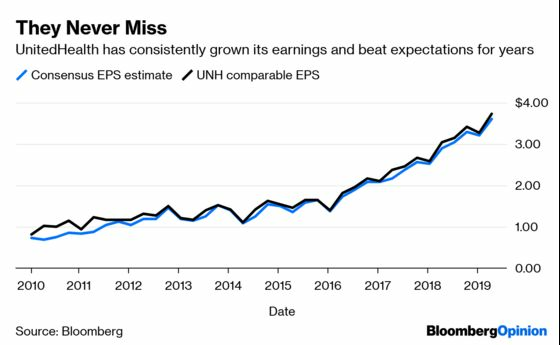 That’s par for the course for the company, which hasn’t missed a consensus EPS estimate for a decade. Why is it, then, that UnitedHealth’s stock doesn’t entirely reflect that? Shares of UnitedHealth are down for the year in an otherwise robust market. Several peers are doing worse amid growing anxiety about what’s happening in Washington. Democrats want ambitious health-care reform, the Trump administration is supporting a lawsuit that would end the Affordable Care Act, and Congress is investigating the systemic roots of high drug prices; all of these things have the potential to roil the health-insurance industry. Tuesday’s results are a reminder that the status quo remains profitable, and UnitedHealth’s shares even enjoyed an early spurt in response to the buoyant earnings news. And yet, it felt like more of a temporary reprieve than a sign investors have thrown policy concerns aside. UnitedHealth has a strong presence in most big insurance categories. Its Optum unit includes a pharmacy-benefit manager that negotiates drug prices, analyzes a massive trove of health-care data and runs a large network of clinics and surgery centers. It’s the company’s most profitable unit, and it helps to keep costs low on the insurer side of the business. If any managed-care company is built to survive turbulent regulatory waters, it’s this one. In that light and after strong results, it’s tempting to dismiss policy concerns as noise. The insurer lobby has a strong track record of pushing favorable policy and avoiding damage. 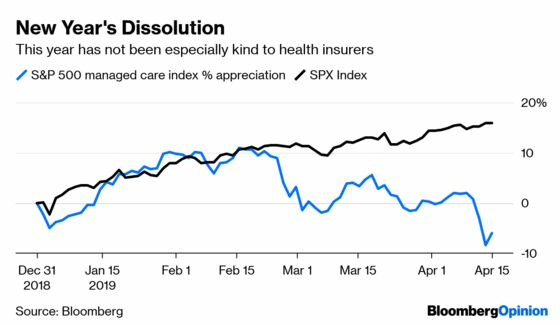 The worst case scenario for UnitedHealth and its peers in today’s unsettled times – a Medicare-for-All plan that eliminates private insurance – remains a long shot. The ACA is also probably going to survive the administration’s legal challenge, averting a disruptive regulatory mess and coverage losses. Still, it’s tough for investors to feel certain about what’s next. The environment has shifted in a way that’s not good for insurers. Even the moderate cohort of the Democratic presidential primary pack largely supports some kind of government-run public insurance option. More ambitious versions of such a policy could be quite damaging to UnitedHealth. The Trump administration and Congressional efforts to reform drug prices aren’t quite as chilling; some proposed policies could even benefit insurers. But OptumRX is the country’s third largest PBM, and that entire sector of drug-pricing middlemen has come under increasing scrutiny for its alleged role in keeping some prices high. “Just to get the lobbyists in the room to shudder a little bit, I think the PBMs should be utilities, or converted to nonprofits, or something,” Democratic Representative John Sarbanes said at a recent hearing on insulin prices that included a UnitedHealth executive. Those aren’t exactly reassuring words, and Republicans haven’t been much friendlier. A Trump administration regulatory effort to pass more drug savings to seniors on Medicare could take effect next year, which adds nearer-term profit anxiety, and Congress could do more damage in the future. Tuesday’s results reflect the market-friendly environment of today, but it’s tomorrow investors care about. Ahead lies a few years of campaigning, hearings, and threatening policy proposals. That means more potential jolts for shareholders, and perhaps a rethinking of the outlook for what had been considered one of the safest companies in a safe sector. Uncertainty lurks every day; earnings only come four times a year.